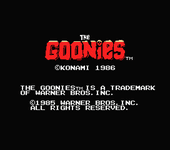 The Goonies is a side-scrolling platform-game developed and released by Konami in 1985 fro the MSX system. The game consists of 5 levels. The goal of each level for the player is to rescue 7 people. After that's done the way to the next level opens up. For each level a password is given, so a player can start at the beginning of a level, once he got that far.